Rev. Henry Riggs, an American missionary born in the Ottoman Empire, gives a firsthand account of events in Harpoot (Kharpert) during the fateful days of World War I. Writing immediately after the events, Riggs relates the story of the destruction his Armenian friends and neighbors within the context of the Ottoman war effort on the Caucasian front. In vivid detail, he describes the induction, supply, and training of raw recruits in the Ottoman army the systematic way the Armenian Genocide was carried out in Harpoot, and the face-to-face interaction between victim and victimizer the deportation of Kurds, the uprising of Kurdish tribes in the Dersim, and the significant role Kurds played in saving tens of thousands of Armenians the difficult task of organizing clandestine relief in the heart of the empire. Days of Tragedy in Armenia is probably the most detailed local history of the Armenian Genocide written in the English language. Riggs captures, in a forthright style, both tragic and ironic elements of the momentous events he witnessed, and integrates them in a disturbing yet highly readable narrative. Students of the First World War and the modern Near East will find this volume to be essential reading. Rev. Riggs was born in Sivas in 1875 to a family of missionaries stationed in the Ottoman Empire. He grew up in the area, traveling to the United States to attend Carleton College in Minnesota and Auburn Seminary. He was president of Euphrates College in Harpoot from 1903 to 1910. After a break, he resumed missionary work in Harpoot in 1912, where he stayed until 1917. He worked as a teacher and evangelist among Armenian refugees in Beirut from 1923 to 1940. Rev. Riggs died in Jerusalem in 1943. 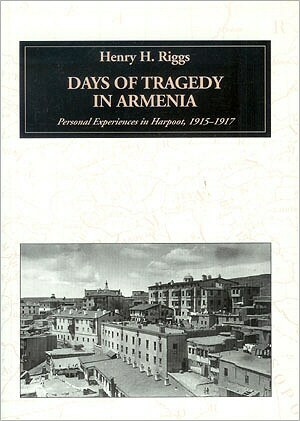 Days of Tragedy in Armenia: Personal Experiences in Harpoot, 1915–1917 - Amazon's online bookstore.